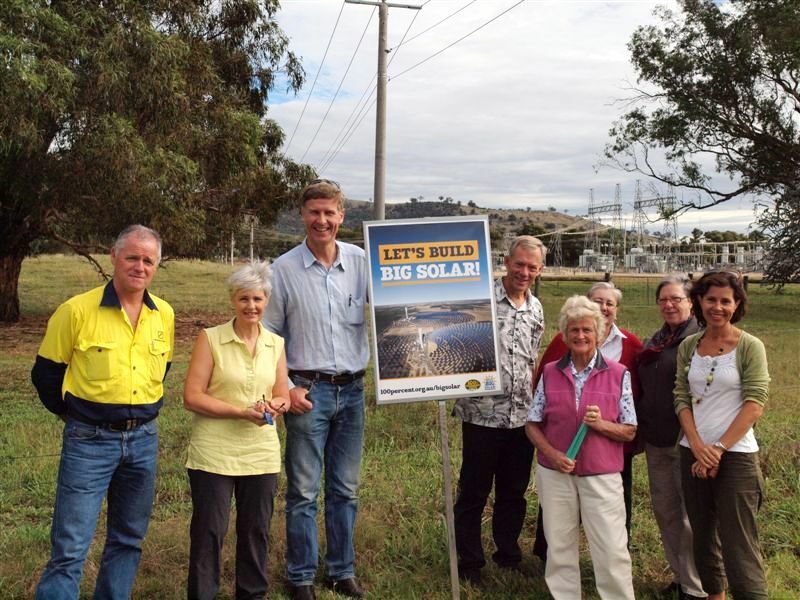 The morning of Friday 2 March saw a small but hardy bunch of renewables enthusiasts congregate on the outskirts of Wodonga to launch the ‘Let’s Build Big Solar’ campaign. Plans had included sunscreen as well as gumboots. Luckily the weather was kind and it was at least dry if a bit windy. The launch location was a large block of land behind the Wodonga Salesyards in Bandiana which had been identified by the North East Greenhouse Alliance as a potential site for a large solar thermal power station. Indeed with its existing power substation (i.e. existing transmission line infrastructure) and flat, open land it appeared an ideal site. 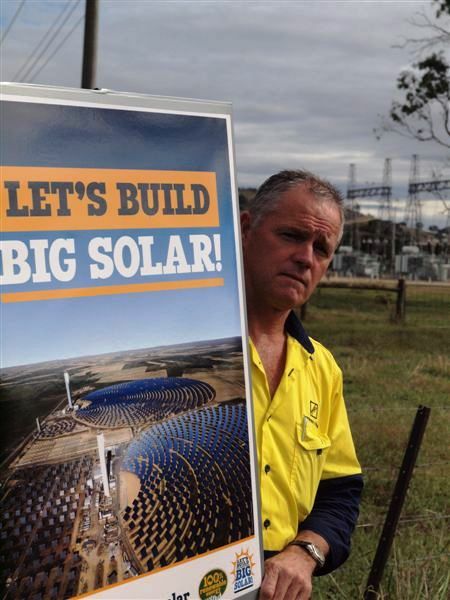 The purpose of the national Let’s Build Big Solar campaign is to rally community support for medium to large scale solar energy plants and to encourage the Federal Government to provide funding for such plants through its $10 billion Clean Energy Finance Corporation. This month will see many other grassroots Climate Action Groups from around the country conduct similar launches in their local areas. After viewing the site, posing for photos and speaking to reporters from the Border Mail and Newsweekly, attendees of the Albury-Wodonga launch were treated to a stimulating presentation by the Managing Director of PSE Communication and Electrical, Paul Shelley. Paul and his wife visited Spain recently and attended guided tours of the three solar thermal power stations (Gemsolar, Valle 1 and Valle 2). Spain has undergone an incredible transformation, moving from being a net importer of electric ity to a net exporter, thanks to the construction of countless acres of photovoltaic arrays and wind turbines as well as the solar thermal power stations. For a country with less solar intensity than Australia it is clear they are streets ahead of us. The Australian Government needs to get its act together and make good its commitment to large scale renewables. 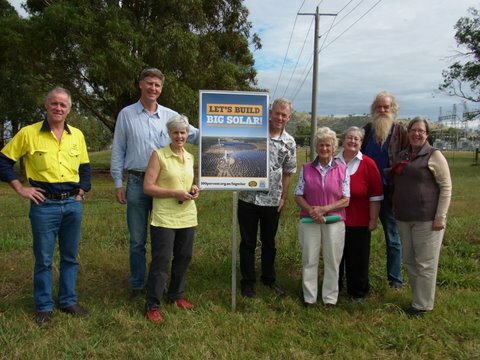 In the next couple of months, WATCH members, together with people from many other Climate Action Groups around Australia, will be conducting thousands of community surveys to gauge community attitudes to big solar and then present the findings to Parliament. If you would like to participate in one of these brief (less than 5 minutes) surveys or are able to assist with conducting some surveys, please contact Lauriston Muirhead on 0419633297. Argoon, A. ‘Solar plant pie in the sky, says Sophie‘, Border Mail, Saturday 3rd March, 2012, page 29.